From reviews: "There is no comparable book on the market; in fact, this is the best teaching tool currently available. The case study methodology is unique and extremely effective. The authors have outdone themselves and congratulations are in order." 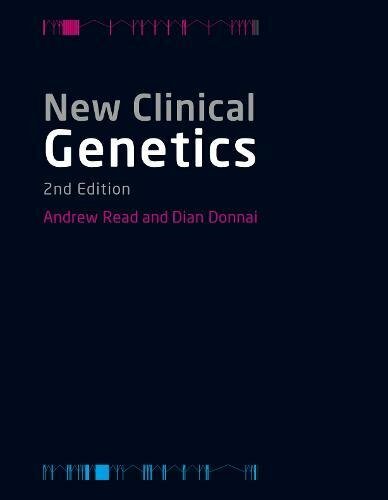 Doody's Reviews, Jan 2012 "This text is a must-read for anyone wishing to stay current with the fast-paced field of clinical genetics." OrphaNews Europe From reviews of the first edition: "Very few books have attempted to do what the authors have accomplished so well. They make genetics simple, attractive, and real. They provide a link between daily situations in the practice of clinical genetics and the complex information available in human genetics. I look forward to subsequent editions of this wonderful work." Doody's Notes "This book provides a wonderful case-based learning environment. There are also self assessment questions. Students are not given model answers but are provided with guidance on how to work out the correct answers for themselves. Excellent!" Human Genetics "This book is a very valuable tool that will be used by future geneticists all over Europe and beyond, both as a teaching material and as a source of excellent knowledge." European Journal of Human Genetics "The book can also be read through the case studies which span the chapters and follow the experience of individual families to illustrate specific points. This is a novel approach and, as in real life, the information on families is slowly teased out, covering a combination of topics. The use of such case studies brings genetics to life." Ulster Medical Journal The second edition of New Clinical Genetics has been comprehensively updated, but the unique structure and format of the first edition have been retained. New cases have been introduced covering Fragile X and the identification of an underlying chromosome problem by SNP chip analysis. While many of the basic scientific principles remain, much new material has been added: * SNP arrays and next generation sequencing (including whole exome sequencing) are described and their impact on clinical genetic services discussed * noncoding RNAs are covered in more detail * developmental pathways are discussed in the context of the RAS-MAPK pathway * the value and limitations of genome-wide association studies for identifying susceptibility to common diseases are reviewed in the light of the extensive experimental data now available * the final chapter has been substantially enlarged to show how genetic services are delivered and the increasing role of clinical geneticists in patient management The innovative integrated case-based approach coupled with the clear writing style of the authors has made this book a hugely successful textbook for medical students worldwide. It is also an essential guide to modern medical genetics for all those involved in the field, from clinical and nurse geneticists to genetic counselors. Printed in full colour throughout.